The distinguishing characteristic of a Faroese shawl is a center back gusset between two triangular side panels. Increases are made in the side panels. 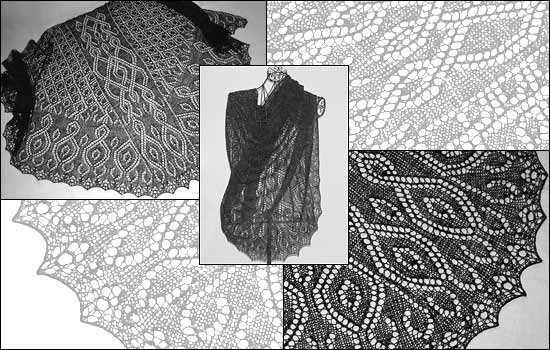 The Faroese shawl *Melissa* is worked top-down from the middle of the neckline. The gusset includes an ornamental pattern. The triangles on both sides start with a small lace pattern and end with an ornamental pattern on the way to the edging. The edging itself is rather small and blends in well with the ornamental parts of the design. Pattern contains charts that are divided into pieces for printing out. Glue them together to see the complete shape.